Introduction to Fluid Mechanics, Second Edition, uses clear images and animations of flow patterns to help readers grasp the fundamental rules of fluid behavior. Everyday examples are provided for practical context, before tackling the more involved mathematic techniques that form the basis for computational fluid mechanics. This fully updated and expanded edition builds on the author’s flair for flow visualization with new content. With basic introductions to all essential fluids theory, and exercises to test your progress, this is the ideal introduction to fluids for anyone involved in mechanical, civil, chemical, or biomedical engineering. Yasuki Nakayama was an internationally influential and respected expert in both mechanical engineering and visualization. During his career he held posts in Japan including President of the Future Technology Research Institute, Professor of fluid mechanics and visualization at Tokai University, and at the National Railway Research Institute. He was also a Visiting Professor at Southampton University, President of the Visualization Society of Japan, and Director of the Japan Society of Mechanical Engineering. He published over 180 research papers and more than 10 books, was a cofounder of the Journal of Visualization, and his research earned him many awards and distinctions including the Medal with Purple Ribbon from the Emperor of Japan. He sadly passed away in 2016 before this book was published. Introduction to Fluid Mechanics, 2nd Ed. 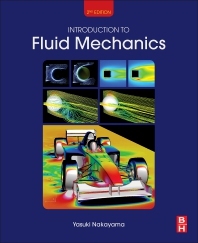 The book gives the best broad overview of fluid mechanics available. Also, references to the interesting Japanese fluid mechanics literature is included.